Cycling from Tiszaörs via Tiszafüred to Mata in Hungary, visiting nature reserve at Lake Tisza. Hotel at Tiszaörs. Breakfast nice roll, no juice, tea Ok, scrambled eggs very good. 3 story place and we were in second floor and it seemed a long way up and down carrying the suitcases - thanks for the assistance from Peter, the cycle tout leader. We set off in a coach for the first few miles to avoid cycling along a road with expected heavy traffic. 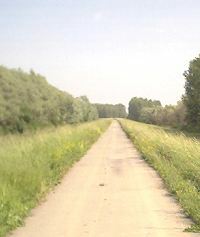 At Tiszaigar we got on our cycles and then cycled to the town of Tiszafüred where we continued through to the southern barrier dyke of the Tisza river. We parked up the bicycles and prepared for a boat trip. Just beyond the dyke was a wide area of water where the water level was controlled alongside the river Tisza, allowing flood water to spread out when necessary, as had recently been the case. The water lakes were a nature reserve and the islands unspoiled locations for breeding water birds. Along the dyke were a number of holiday homes, boats and fishing locations. There were 5 boats laid on to take us out. Each boat took four people and we all went on a one and half hour expedition around the lakes. Initially we went north east and eventually reached the sluice gates where the River Tisza water was allowed in to the side lake. The sluice gateway was open and we motored out onto the main river Tisza itself. We then turned left and then went downstream till we could turn back into the side lake (no sluice gate) and thence back to the starting point. We saw several birds including night heron, grey stork, hawk and two mallard ducks. Peter was able to take some excellent close up photos of the birds using his digital camera, which although physically small had a very powerful telephoto capability. We saw a few dead fish in the shallows amongst the reeds. The recent serious flooding had had a dramatic effect on the foliage of the many trees on the islands, all of the lower 6 feet or so was affected with the foliage dead and covered in grey dust. On our first day we had seen similar effects up to 18 feet above the normal level, so I guess the excess level varies according to the width of the river at the relevant point. After the boat trip we had lunch at a newly built restaurant constructed in recently the flood area. The thick roof was all new straw and the supporting structure was made of freshly sawn and assembled wooden poles. It was clearly the work of some skilled carpenters and craftsmen. The food had been prepared on board a boat further along and was brought along in big bowls. Lunch was fish soup flavoured with paprika pepper. Tasty. After lunch we started out cycle tour again and set off in a north east direction along the dyke. Initially curving around the lake with views of the water and fishermen and then after a a few of miles we were amongst the bordering trees, so you could see the river only occasionally thorough the trees on the left. The km markers on the ground every 100m helped maintain morale as we cycled along, with the wind behind us. At one of the frequent refreshments stops I took photos of the view behind and the view ahead which were almost identical. 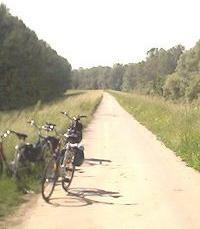 At around Tiszacsege we put the cycles on the trailer and were taken to Mata, just north of Hortobagy, by coach. The Hotel at Mata was a smart horse riding oriented place with associated stables. The hotel had a large conventional indoor swimming pool which was good for a pleasant swim. There was also a small sauna upstairs. Page started 29 May 2006. Last amendment 12 May 2016., 16 Feb 2019 HTML5 (c) 2006 SSL all rights reserved.